Click on a section heading to show its contents in the suggested reading order. Optimum Quantity for a Final Output: How Much Bread? Optimum Quantity for a Harmful Output: How Many Cigarettes? Optimum Quantity for an Intermediate Output: How Many Trucks? Optimum Quantity when Value is Zero: How Many Concerts? Optimum Scale for the Economy: What Level of Total Outputs? Exports—What to Do with Potatoes? ENL's value concepts are based on physical health, but there is clearly more to well-being than this. Some consumption is desired not because it maintains our bodies, but because it is enjoyable. Both health and enjoyment are valid criteria when making production decisions, and ENL thus requires terms to analyze both. For this reason, a need is defined as a consumption desire that increases health when it is satisfied, whereas a want is a consumption desire that does not increase health when it is satisfied. However, wants are potentially infinite, which means that their full satisfaction would inevitably lead to environmental damage. For this reason a further distinction is required. A sanctioned want is one that society has decided to satisfy, and an unsanctioned want is one that society has decided not to satisfy. ENL's treatment of environmental constraints addresses the factors that bear on these sanctioning decisions. The following figure illustrates the above terminology. Consumption desires are split into needs, which increase health when they are satisfied, and wants, which do not have this effect. Wants in turn are split into sanctioned wants and unsanctioned wants. 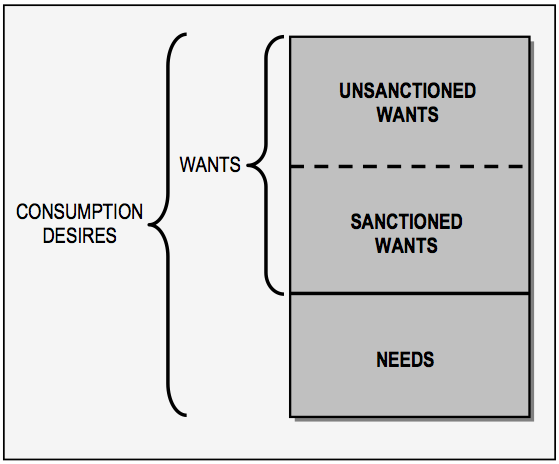 Note that needs and wants are references to consumption desires, not to the outputs that satisfy those desires. This distinction is most obvious when an output that is ingested, such as food or drink, increases health at low quantities but decreases it at higher quantities. At low quantities an output like this satisfies a need, but when its effectual value drops below zero its consumption no longer increases health, and it therefore satisfies a want. Standard economics, which reflects the realities of capitalism, refuses to make the above common-sense distinctions. The discipline of course acknowledges consumption desires through the concepts of subjective value and utility. However, it does not split these desires into needs and wants, thereby ignoring the fact that some desires have an objective, physical basis, while others do not. As well, because the standard discipline does not recognize wants in the ENL sense, it does not recognize the split into sanctioned and unsanctioned wants.